I haven’t been able to participate much these last few months. I didn’t need another cookbook, and I have only a few Diana Henry recipes available but this week is POTLUCK with The I Heart Cooking Club so I knew I had a recipe I could use. Lucky for me Amazon offered a copy of Ottolenghi’s PLENTY for the Kindle and I have been looking through his yummy dishes. He has a whole section of eggplant recipes. Like this one. I had just picked up a couple of eggplants at the store so I was ready for this new side dish. Set the whole eggplant over a flame and burn until crispy all around. Cool and then remove the flesh with a spoon. Make sure you leave behind all the charred skin. Place the flesh in a colander and allow to drain until most of the liquid is gone. This takes about 30 minutes or so. Mix about 1/2 of the the breadcrumbs, Feta, Parmesan, egg, potatoes, eggplant, and seasonings in a bowl and mix with a fork until well combined. Shape into small patties and cover with the breadcrumbs. Allow to chill in the fridge for about 2o minutes which will firm them up. Place about 1 inch of oil in a pan and heat til hot. Gently place patties in the oil and fry for about 3 minutes on each side until golden brown. All the ingredients are already cooked so it’s just a matter of browning them. 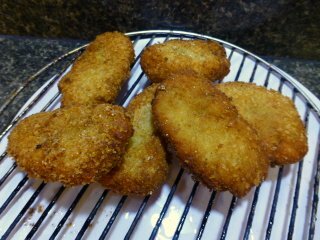 Crispy on the outside and creamy on the inside, these were very good and are definitely keepers. I would like to try them with another cheese – Fontina, maybe, or Gruyère for a different flavor.